868 White Shepherd Dogs adopted on Rescue Me! This map shows how many White Shepherd Dogs are posted in each state. 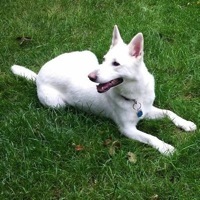 White Shepherd Rescue Information: A White Shepherd is a German Shepherd bred for its white coat. White Shepherds are more timid and sensitive than German Shepherds and should be trained gently. White Shepherds are very protective, but not hostile; they make great guard dogs and wonderful companions. White Shepherds should be well socialized early in life. White Shepherds that are properly trained and socialized are good with children and other pets. This breed can adapt to apartment life with sufficient exercise. White Shepherd Trivia: White Shepherds resulted from a genetic accident when some German Shepherd puppies were born without color. White Shepherds are only recognized by the United Kennel Club as a breed distinct from German Shepherds. White Shepherds are trained as guide dogs. White Shepherds tend to live longer than other dog breeds. White Shepherds are especially protective of children.